Price Regulation creates a short term demand spike in Cardiovascular Market but a difficult road ahead. India has seen a rapid transition in its heart disease burden over the past couple of decades. The load of communicable and noncommunicable diseases is projected to get reversed in 2020. Demographic projections suggest a major increase in cardiovascular disease mortality as life expectancy increases and the age structure of the growing population changes. A conservative estimate indicates that there could be more than 30 million heart patients in India. If the current trend continues by the year 2020, the burden of atherothrombotic cardiovascular diseases in India will surpass other regions of the world. The overall Market size is about ₹2500 Cr. and is growing at an annual rate of 16-18% on an average. 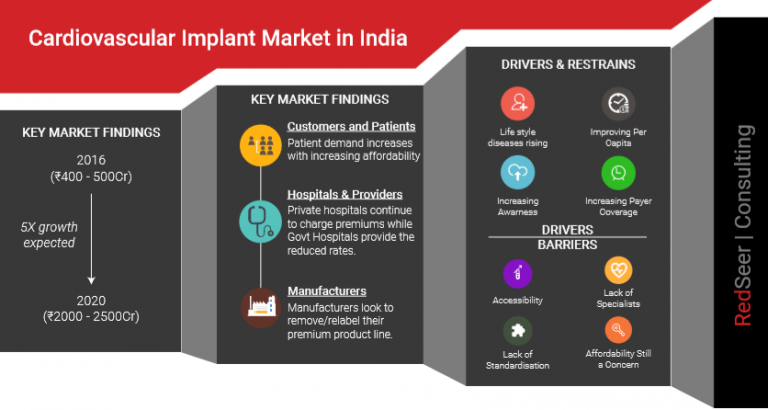 The market for cardiovascular implantable devices is expected to reach ~4500-5000 Cr. by 2020. Stents have the maximum share due to high demand, as CHD/CAD are growing at a rapid speed in India, for which coronary stents are used. On 13 February 2017, NPPA fixed ceiling prices of bare metal stents at ₹7,260 per unit and those of drug-eluting stents and vabiodegradable stents, which account for 95% of the current market at ₹29,600 per unit in a bid to provide affordable treatment to patients. The ceiling prices came into effect immediately and were also applicable to all stocks in the trade channel. While the immediate impact of the government's action was a cry of relief from patients and outcry from the manufacturers, RedSeer spoke to multiple cardiologists/ cardiac surgeons/ key. Governmental regulation which has brought the pricing for coronary stent by nearly 80% is making these devices available to much low and middle income segments in the short-term. With an expectation that nearly 10% of the overall population being expected to suffer from CVD, this would create a much larger customer base going forward. In the short term, the manufacturers have appealed for the removal of some of their premium product lines, include Abbott and Medtronic. In addition, they are also looking to relabel some of these products to avoid falling under the NLEM categorization for drug eluting stents. In the longer term, this move is expected to have a much larger negative impact with companies expected to not launch newer models and newer technologies for fear of being under price regulation. This would only hamper the prospects for some of the patients whose well-being depends on the use of these products. With payers also ensuring that reimbursements are only paid for the price set by the Government, the lack of sufficient stringent enforcement, some private hospitals have taken to creating packages by bundling other services including, hospital stay, diagnostic services, doctors fees, etc.. to ensure that the overall price remain are pre-regulation levels for the end consumers. Overall, the move by the government to reduce prices could have a larger negative impact on the growth of this segment due to reduction in R&D investment, the inability of existing local manufacturers to create innovative cheaper alternatives and the disparity in the pricing for the end consumer due to provider margins.